We spent less than ten dollars for a fifteen-pound turkey this year. We brought the turkey home from the store in the trunk of one of our three cars. We stored it until it was time to thaw in one of our two freezers. And when we feast with our friends and family tomorrow, we will do it across two of our five tables, spaced out luxuriously over two of the four rooms of our house that could be utilized for such an occasion. America is a land of plenty. And even though it may not always feel like it, in the midst of busy holiday preparations, America is a land of ease. Especially when it comes to Thanksgiving turkeys. There have been several times this month, however, when I’ve thought back to the way things used to be, when our family lived in the Netherlands. I remember one year, in particular, when we were preparing to host a bunch of our friends, and we were having a hard time procuring enough turkey to roast for the feast. 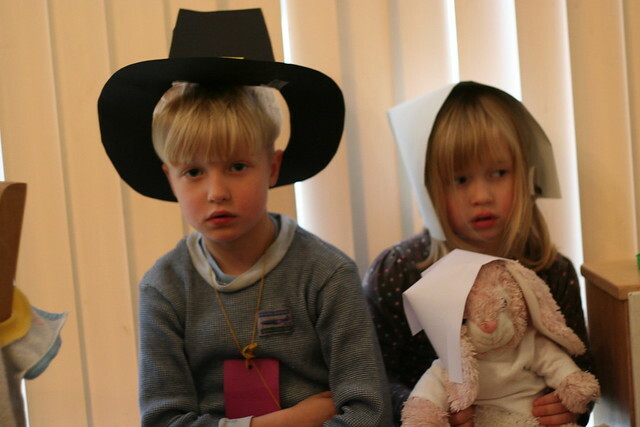 The Dutch don’t celebrate a Thanksgiving holiday, like Americans do. And even if they did, I don’t think the small, urban grocery stores in Amsterdam would have been able to stock large, whole birds in sufficient quantities for the general populace, like Americans do. So I was pretty excited when I was able to find a good-sized turkey (maybe nine or ten pounds) for something like twenty-five dollars at the neighborhood street market. Twenty-five dollars was way more expensive than what it would have been to buy such a turkey in the United States, but way less expensive than it would have been to purchase several separately-packaged turkey breasts from the poultry section of the grocery store. We were proud of our problem-solving, since the temperature in our backyard was at least as cold as our refrigerator, and we figured that the latch mechanism on the file cabinet would be enough to deter critters like mice and pigeons which might want to prey upon our turkey. We were not prepared, however, for a different sort of predator: bacteria. When I opened the file cabinet on the morning of our Thanksgiving feast, I nearly vomited on the spot. The turkey smelled putrid. There was no way we could attempt to roast and serve such a rotting carcass of salmonella. So we found ourselves back at Rechthoek Één (Square One). In a state of panic, we consulted with some Dutch friends and eventually decided that our best course of action would be to visit the local poultry shop. Partly due to gaps in our Dutch vocabulary and partly due to our limited worldview, we didn’t even know that poultry shops were a thing — and that there was one relatively close to our house! So anyway, I rode my bicycle there as fast as I could and asked about their turkeys. It turned out they didn’t have any large turkeys in the shop (though they offered to order one for me), but they did have two smaller turkeys: maybe five or six pounds each. I sighed a deep sigh of relief and said we’d take them. But when they rang them up on the cash register, I was shocked to learn that the total cost for these two turkeys was something north of one-hundred dollars. I swallowed hard and paid for the turkeys because we had guests coming over: friends from the United States, the Netherlands, England, and Japan. I figured “What’s a Thanksgiving feast without a turkey?! 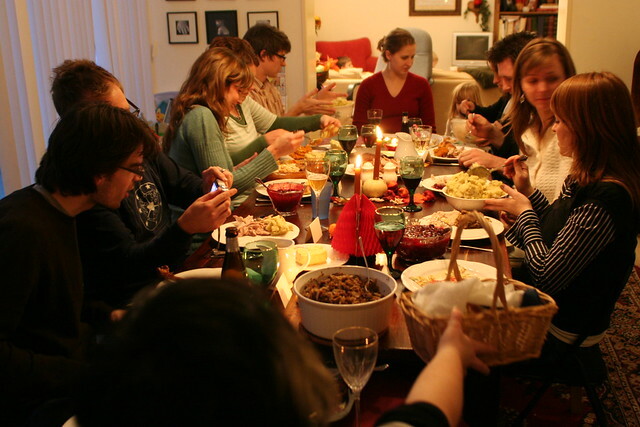 ?” And when we eventually crowded together around a series of folding tables cobbled to run through the entire living space at the front part of our apartment, we really did have a lovely time celebrating Thanksgiving together. 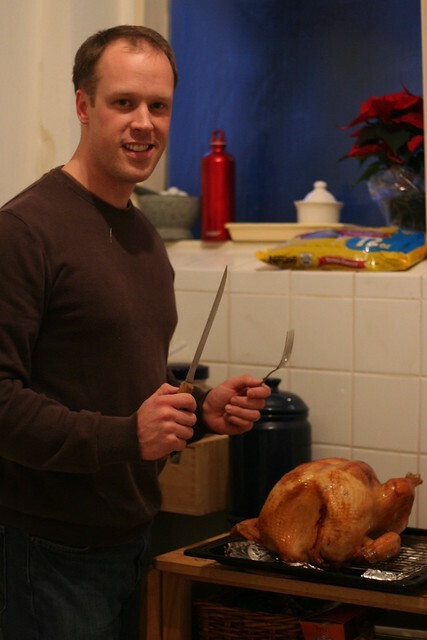 I now have fond memories of the Thanksgivings we spent in the Netherlands. I’m thankful for the way they shaped me and my family — as well as our sense of “extended family” in Amsterdam. I’m thankful for the way our Thanksgivings in the Netherlands have taught me not to take all these simple joys of turkeys and cars and freezers and family gatherings for granted. But I’m also thankful that I can keep the bicycle in the garage and the food in the kitchen until it’s time for us to feast together this year. This entry was posted in Amsterdam, Culture Shock, Europe, Family, Food, Home, Nostalgia, The Netherlands, Traditions. Bookmark the permalink.